NOTE: I do not get enough inquiries about this to justify stocking the pc boards, chips and other parts. Here is a zip file with pictures of the pcb traces and the source code listings. It is all I can offer at this point. This is something that I designed recently for my own use during a consulting job. If you are interested in building something like this, please contact me. I would be willing to supply the PC board layout file and programmed PIC chips. You would need to supply the rest of the parts, using my parts list. 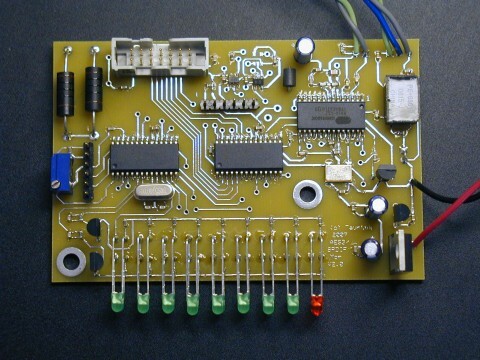 This photo shows a fully populated Digital Audio Monitor pc board. Wires at top connect to RCA jack for SP/DIF and XLR (balanced) professional digital audio connector through small transformer at upper right. Red and black wires are power connection. Dual-row connector is for standard HD44780-based four-line LCD module, with support for backlit type. (Potentiometer adjusts LCD contrast) Two PIC chips are used. One is dedicated to level meter function. Second PIC reads status info and controls LCD module. Third chip is DIR (digital audio receiver chip). Second row of LED's is directly underneath the visible one. Top line shows which jack is currently selected (SP/DIF) and the incoming sample rate (44.1 KHz). Second line shows consumer mode status format is being used, and that the "Orig" bit is set. Third line shows that the "Valid" error bit is set. The word length is 0, as my old CD player did not set these bits properly. 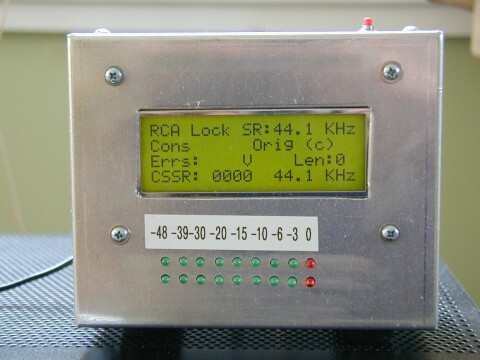 CSSR shows the channel status sample rate bits, in this case all zeroes, which indicates 44.1 KHz. Top pushbutton can be pressed to make the fourth line of the LCD display the first five bytes of either the A or B channel status data. LED level meter shows peak levels in dB, relative to 0dB. Here are the page1 and page 2 of the schematics and the parts list. Copyright © 2007-20017 by TaunTek.com. All rights reserved.